It's night time in the Big City. In a loft apartment, a young man rummages through a shelf of old audio tapes. He stops, re-reads a label. He doesn't know the title on the box, but he definitely recognizes at least one performer's name. "Can I listen to this?" Bob Dylan asks. 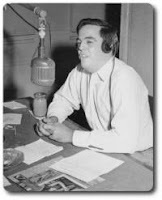 In the summer of 1940 Alan Lomax began work on one of his long-time pet dreams, a folk music series for prime time network radio. Lomax would act as the writer and long-distance producer for Back Where I Come From from his Washington, D.C. home base, while his pal Nick Ray would be the on-scene New York City director. To give the series the creative foundation it needed to be more than just another hillbilly radio show, Lomax came up with the idea to have each of the programs dedicated around a theme - trains, marriage, animals - and would include skits and dramatic readings as well as songs on that night's subject. The theme idea probably came from the all-night singing contests that Guthrie, Lomax and other invited folksingers delighted in, where the group would challenge each other to name as many songs as they could on a given subject. During one six-hour evening, Lomax recalled, he and Guthrie came up with over 200 songs about animals and stopped singing only after neighbors threatened to call the police. The pilot of Back Where I Come From aired on August 19, 1940 on the Forecast series; a try-out incubator for new CBS radio shows. The first episode was hosted by Clifton "Kip" Fadiman, a New York literati - writer, editor, and critic - who was already well-known to radio audiences as the host of the popular Information Please quiz show, which he would moderate for 17 years. Joining Fadiman were Willie Johnson and the Golden Gate Quartet, Josh White, Burl Ives, actor Len Doyle, and Woody Guthrie. Just like the first episode of Theme Time Radio Hour sixty-six years later, the theme of the first episode of Back Where I Come From would be... the weather. That first 30-minute show was, charitably speaking, a bit uneven. Whatever his skills as a music historian, Lomax was a ham-fisted writer, at least as it came to radio dialog. With the exception of Guthrie's relaxed, entertaining segment on the Dust Bowl and the Golden Gate Quartet's closing gospel sermon-in-miniature about Noah and the Flood, which sounded as if it were being delivered direct from a Baptist Church, most of the show was leaden and artificial. It was all very "merry" and "jolly" Lomax would later write sarcastically, and had little of the authentic voice of America he wanted. 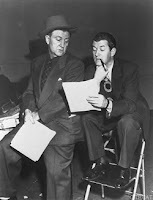 Typical of the pseudo-folksiness in the first episode was a lengthy segment starring Len Doyle, sometimes described as a "cornpone comedian" in accounts about the pilot. In reality the cornpone was being supplied by Lomax, and Doyle was actually a journeyman character actor who would later move on to the popular Mr. District Attorney crime drama that same year, and stay with that show for a 12-year run. Doyle was probably relieved to find a better gig than "The Natural-born Expert" role he had been saddled with on Back Where I Come From. "The Natural-born Expert" was a particularly irritating "done-everything and knows-it-all" character, delivering his pronouncements in a W.C. Fields-like voice, and was apparently conceived by Lomax as a foil for Guthrie, who dryly interrupts Doyle's "Now, you take me-" blustering with, "Brother, I wouldn't take you to a Sunday dance." Happily, there are genuine nuggets in the show too, especially its major production number, intermingling Woody's So Long, It's Been Good to Know You with dramatic vignettes illustrating people's response to the Great Dust Storm of 1935. The pilot of Back Where I Come From was generally regarded as a success by CBS execs., who took the unusual step of moving ahead with the series even though the show had been unable to secure a sponsor. We might take a moment to reflect on this: Here's an experimental show on folk music, hosted by a New York intellectual, with a cast of relatively unknown black and white artists, some of whose politics is a bit Red, and all sharing the stage on a equal footing. The show can't find a sponsor... and the network decides to put it on the air anyway. Somehow you can't imagine that happening today. In any case, Woody, who had been paid $83 for doing the pilot, found himself an overnight radio sensation thanks to Back Where I Come From. In close order Guthrie was invited to sing on a CBS talent show and offered three hundred dollars to write and perform a ballad about Wild Bill Hickok for a new NBC radio series. But both offers were topped by the Model Tobacco Company, who wanted Guthrie as host for its weekly show on CBS, Pipe Smoking Time. Pipe Smoking Time offered $200 a week, and with an agreement that Woody could keep his role on Back Where I Come From, which paid $150 a week, Guthrie's income had gone from problematic to healthy in a matter of days. But not without problems. Back Where I Come From began as a regular program in late September 1940, and by the end of the month Woody Sez - Guthrie's popular column for the U.S. Communist Party's newspaper The Daily Worker - was discontinued without explanation. A spokesperson for the Party said it had been done by mutual agreement. Guthrie later claimed he had been fired for being "too wild." The truth might have been that the Daily Worker wasn't happy about having a people's columnist who was also going to flog tobacco for a capitalist boss. Or maybe Woody was feeling overstretched and guilty. Certainly he started acting as the gadfly on Back Where I Come From, where he had much more influence than the tightly controlled Pipe Smoking Time. Less than a month after the series start, Guthrie was threatening to quit over what he felt was Nicholas Ray's obstructionist attitude towards Huddie Ledbetter, better known as Leadbelly. Ray wasn't enthusiastic about Leadbelly's appearances on the show, feeling that his thick accent was incomprehensible to a white audience. Worse, Leadbelly was functionally illiterate, meaning that he couldn't read the lines scripted for him. Woody didn't care; he wanted his friend to have a regular role on the show. And if he didn't, then neither would Woody. Lomax arranged a long-distance compromise, and show regular Josh White ended up reciting Leadbelly's spoken lines, while Leadbelly himself continued to sing his songs. But still in conflict with Ray about almost every facet of the show, Guthrie quit in late October, eventually missing a few episodes before Lomax again stepped in as mediator between the two. Guthrie would return and eventually take on a larger role in Back Where I Come From, narrating several shows, including what would become Nicholas Ray's favorite, a December 6th episode on the 13th Amendment. In the interim, Pipe Smoking Time with Your Host Woody Guthrie had begun its run in November of 1940, and Woody found that the Model Tobacco Company was a much harsher boss than Lomax and Ray. Guthrie was almost immediately sickened by the compromises he was forced to make - including singing a rewritten version of So Long as the show theme - and by the end of the year he had had enough of radio. In early January 1941 Woody sent off an "I Quit!" letter to Nick Ray. He may have done the same with Pipe Smoking Time's producers. The record is unclear about whether he was fired, quit, or simply walked away from the program after only seven episodes. In any case, he was gone, "lit out again," as he would write to Lomax. 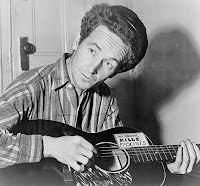 Typically, Woody Guthrie would bounce between a desire for commercial success and then do his best to sabotage his own chances whenever success seemed within his grasp. By February 1941, he was writing an apologetic letter to Nicholas Ray from California, asking for his old job on Back Where I Come From. But the show - still without a sponsor - had been canceled by CBS, and that was that. Fast-forward some 20-odd years later, and Bob Dylan is visiting Alan Lomax's loft on West 3rd Street in New York City, where as Dylan would relate, "I spent many nights... listening to and meeting all kinds of folk music people which I never would have come in contact with." One of those "folk music people" Dylan would meet would be Carla Rotolo, Lomax's personal assistant, who would go on to introduce him to her younger sister Suze. 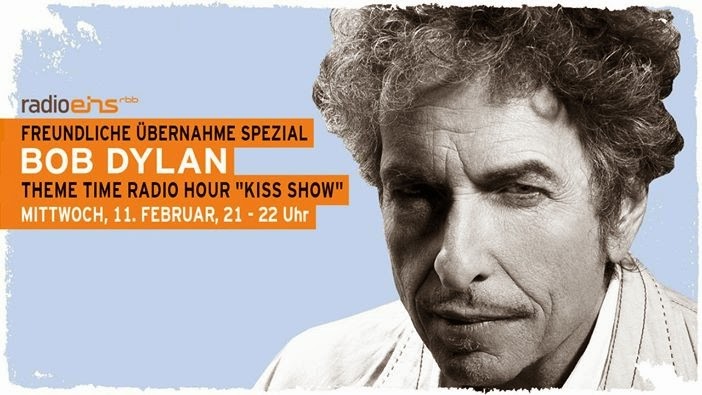 Both Rotolo and Lomax's daughter, Anna, remember Dylan as a regular visitor to the apartment, spending much of his time digging his way through Lomax's extensive music collection, which almost certainly contained recordings of the Back Where I Come From program. You can imagine the 20-year-old pausing as he studied a label for a radio show that aired the year before he was born and starred his hero, live, and at the height of his powers. Fast-forward another 40-odd years, and now we're in the realm of pure fantasy, but imagine: We're still in New York City, in a large room in Greenwich Village, four or five people talking. Jeff Rosen is almost certainly there. Maybe Eddie Gorodetsky. Maybe one or two others of the small trusted cadre. "Well, we know what sort of music we want to play," someone says. "But we need something to tie it all together, I dunno, some sort of-"
Bob Dylan, who doesn't do meetings well, is bored, staring out the window, thinking of the old days in this city, thinking of the apartment he used to visit on a cold, snowy New York day like this. "- a theme," someone interrupts. "Exactly." And the Man Who Never Forgets Anything Connected to Music swings his cowboy boots off the table, clears his throat and says, "Ya got it. We're gonna do a theme radio show. Things like 'Marriage,' 'Trains,' 'Animals.' All songs connected to that theme." Thinking 40-odd years back, Bob Dylan laughs. "And the first show has got to be about the weather," he says. Sources and Further Reading/Listening: Dreamtime wants to thank the reader/listener who sent us an email that set us on the trail of Back Where I Come From and who prefers, as the saying goes, to remain anonymous. But you know who you are, and this episode is dedicated to you with my thanks. Woody Guthrie's involvement with the Back Where I Come From and Pipe Smoking Time radio shows during 1940-41 is noted in both Joe Klein's Woody Guthrie: A Life, and Ed Cray's Ramblin' Man. Although neither biography has a particularly detailed description of that four-month period, with the two together I was able to piece together what I think is an accurate time-line. Bob Dylan's meeting Carla Rotolo and his frequent visits to Alan Lomax's apartment are well-chronicled in several places including, if you'll forgive the pun, Dylan's own Chronicles: Volume One. Anna Lomax's recollection of Dylan's visits to the apartment are from Howard Sounes' Down the Highway. I was pleased to find that the pilot "Weather" show of Back Where I Come From is in wide circulation among collectors, and is available as a torrent on the Web in a number of locations, including hungercity.org. Readers may also be interested in this transcription of Guthrie's So Long segment from that show. Although only one man can tell us whether the idea for TTRH was born from Back Where I Come From, consider whether all this can be chalked up to coincidence. Both shows' pilots were on "The Weather," and both shows have had episodes on marriage, trains, and animals. Bob Dylan was a frequent visitor to Alan Lomax's apartment as well as being a major fan of Woody Guthrie, and was known to immerse himself in Lomax's music collection whenever he had the opportunity. All that makes the possibility shift from "likely" to "near-certainty," in my opinion. I'm a poker player, and I would happily shove my entire stack into the pot on that much circumstantial evidence. August (19) 1940 - Pilot from "Forecast" series for BWICF. August 1940 - Guthrie signs BWICF series contract for $150 per week. Model Tobacco offers him hosting job on NBC's Pipe Smoking Time starting in November 1940 at around $200 per week. Offers includes agreement that Woody can continue gig with BWICF. (Late) September, 1940 - BWICF begins airing for 15 minutes at 10:30 p.m. on MWF evenings on CBS. Show is unsponsored. September 1940 - Woody's Daily Worker Woody Sez column ends without explanation. CWP spokesperson says "mutual agreement." Woody would later claim he was fired because he was "too wild" for the Party. September/October? 1940 - Woody in conflict with Ray over Leadbelly and threatens to walk off show. Lomax provides compromise. Late October 1940 - Guthrie quits BWICF because of continuing conflicts with Ray. Nov (1) 1940 - Lomax letter writes to Woody to get "his side of story" on conflicts with Ray, and offers to again act as mediator between them. Guthrie returns to BWICF after missing at least one show and becomes narrator for many of the following shows. Nov( 25) 1940 Pipe Smoking Time program with Woody as host begins. Dec (6) 1940 - Woody narrates BWICF episode on the anniversary of 13th Amendment's ratification. Ray later recalls it as BWICF "at its very best." Jan (1) 1941 - Most of cast from BWICF plays fund raiser at Will Geer's house. Early Jan 1941 - Woody sends notice to Ray at BWICF and quits/is fired from PST radio show. He and the family return to California. February 1941 - Woody writes to Ray asking for his BWICF job back; Ray replies that show has been canceled.